Murphy’s latest is a haunting tale of love and time travel… Readers will love Lee and Phoebe’s story and will be fascinated by the journey to discover when and where Phoebe is from, and her connection to Lee… [they] begin their journey through Phoebe’s past as they explore the connection that burns so hot between them it’s going to leave scorch marks. It’s a terrifying and beautiful story of courage, love, loss, survival and triumph. I stayed up all night reading it. I look forward to more from this author. This is an absorbing story. I did not want to put it down. The plot is well organized, the characters are well developed, and the intertwined stories all flow flawlessly. This book will have a wide appeal for anyone who loves well turned historical fiction, fiction that highlights early Virginia history, or just excellent fiction in general! 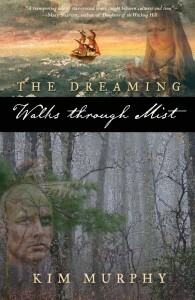 The superb writing, the historical aspects that are exquisitely researched and presented, and a unique premise well told in Walks Through Mist made for one of the best reading experiences I’ve had this year. Not only can I highly recommend this novel to all lovers of mixed genre stories, including science fiction, drama, romance, history and mystery, but I’m absolutely going to be reading the next book in The Dreaming series. This is a most enjoyable and unusual story from an author with a history of writing historical and supernatural novels… if you enjoy history, and the rather rare experience of reading a grownup paranormal romance that features neither vampires nor werewolves, then this is surely for you. A transporting tale of star-crossed lovers caught between cultures and time. The full version of this novel is now available from Coachlight Press in Trade Paperback format; and many fine regular and online bookstores. A Kindle version is also available from Amazon.